The great thing about making popovers when entertaining is that it’s so easy and impressive all at once. You and your guest get to nibble on something fresh and piping hot from the oven, but you can do everything ahead of time. As long as your oven is pre-heated and you have your pan ready, you can thrown the batter in the oven as soon as your guests ring the doorbell. Twenty minutes later, after coats are put aside and fresh drinks are in hands, these popovers come out. Crush some Maldon salt on top just before serving. These and a glass of cava were the first things our guests sampled at the very special Girls’ Night In dinner. 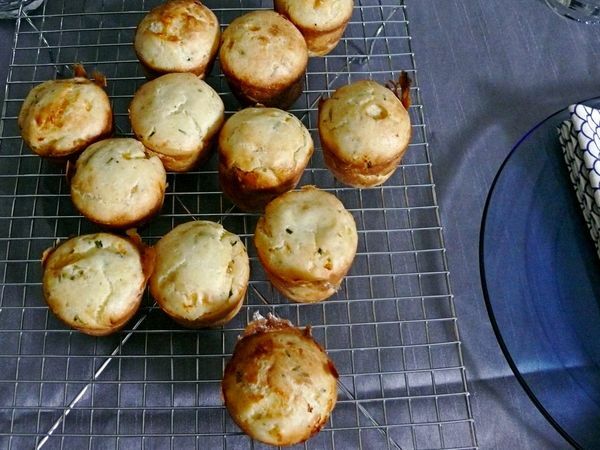 YS note: I adapted a Gourmet magazine recipe for these popovers. Browning the butter gives the popovers a nice golden colour all around. If you are using a silicone pan, you can still brown the butter in the molds, but do not pre-heat the pan before doing so. Cream the fresh chèvre against the sides of a large bowl, using a spatula. Add the eggs and milk to the bowl and whisk to incorporate the cheese evenly and scrape it into the mixture. Add the flour, butter, salt, and pepper and mix until smooth. Stir in Gouda and chives. Chill 1 hour to allow batter to rest. Preheat oven to 425°F with rack in upper third with the popover pan in it (unless using a silicone pan–do not heat it). Remove the popover pan, grease it carefully with butter, then heat in oven for about 2 minutes until butter browns and remove from oven again. Remove batter from fridge, gently stir, pour evenly into pan. Bake for 20 minutes or until golden brown on top. Remove pan from oven. Crush a large pinch of Maldon salt with fingers, sprinkle over popovers. Serve while hot.